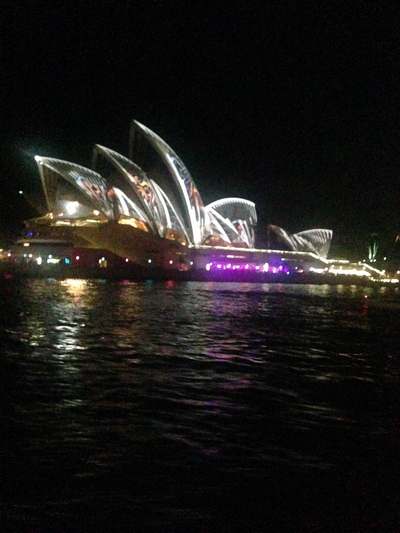 On a Saturday night, heading on a Sydney Harbour cruise from Circular Quay is a magical, simple experience. 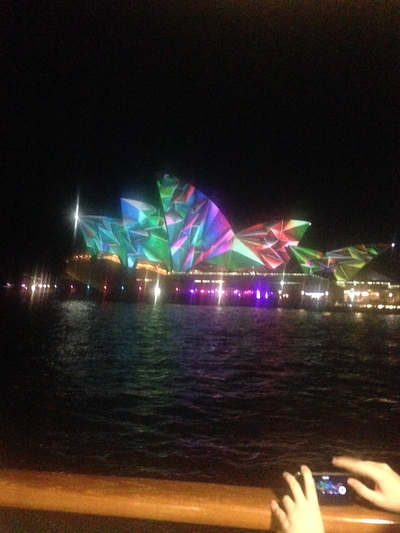 Went to the first Saturday night of Vivid Sydney 2014 last night, as at the time of writing this. The flow steered me towards a pre-light-turned-out-be-a-cruise drink at The Argyle. If a mate of a mate pushes in in front of you at the bar, and if their other mate happens to be generous and courteous enough to recognise that; then my friend you're in for a free drink! That is precisely what happened, and it amplified my spirits from tiredness to aliveness. These older men mentioned that they don't get into the city very often, however they were in for the "lights" on a Saturday night. They were excited, not because they were drinking beer, wondering why the bartender was wasting so much water to keep their glasses cool - when the drink on tap is actually cool to begin with. 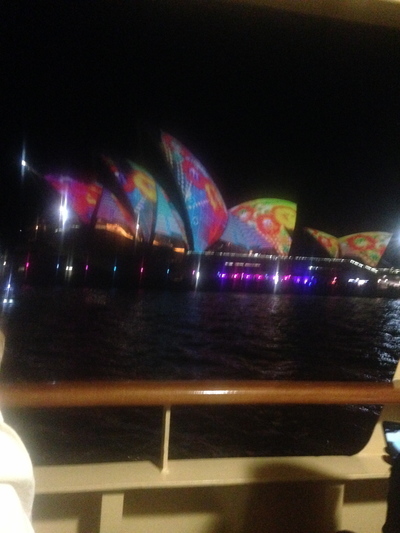 They were excited because they were going on a Vivid Sydney themed cruise of Sydney Harbour. In a smaller boat with the bright neon sign, their boat takes some time to allow them to take happy snaps and appreciate the awesome ambience of Vivid Sydney in the Circular Quay/The Rocks precinct, including some Australian animal light displays near the Sydney Harbour Bridge, as well as other neon lights in the Harbour - not to mention the Opera House. I found a cool (communal) alternative on a tight, frugal budget - not that I am on one at the moment. Got a free drink, score. Yet then again, the drink I wanted came with a free voucher at this particular bar. Still no charge. 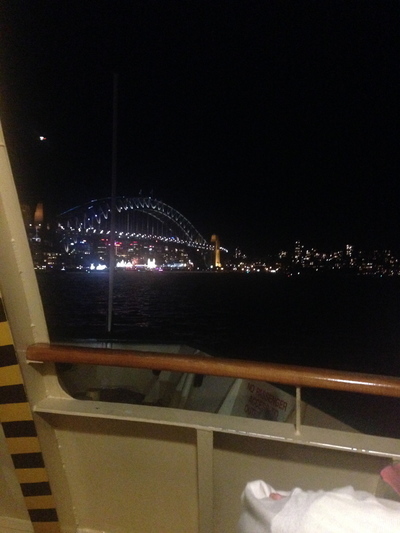 The green and yellow Manly Ferry is now my ideal Saturday night Sydney Harbour cruise, with or without Vivid Sydney. If you're not a local to the Manly/Northern Beaches area; it is a treat to hop on a Manly Ferry in the twilight hours and beyond. Again, this trip was free. Why? If you're an Opal Card user, and you have taken your eight paid trips for the week (precisely what I've done) - all subsequent travel trips where Opal cards can be used are free - irrespective as to where you're travelling. Cool. Who doesn't want a free Harbour cruise. Even better, the non-Manly commuter ferries were also decorated in bright lights for the occasion. Even better, I ensured I got the best seat outside. Yes it is cold and windy during Vivid Sydney time, yet there is nothing that a warm winter coat and even a cashmere scarf cannot fix. It was awesome sitting down for free and scoring great views of the Vivid Sydney vantage points, including the Opera House despite an abundance of photography and flashes going on around you on the boat. I'm sure there are already a fair few Opal Card holders catching onto this Sydney Harbour abundance. It was interesting. As soon as the ferry left the Sydney Opera House, the majority of people went inside. Naturally, I stayed outside. It gets quite stuffy inside the Manly Ferry. Those of us who stayed outside had plenty of room to enjoy ourselves. A different story on the way back - you now get as to why. There was even a cute roaming puppy on board, and a fair few of us outside gave it some pats. You even had a cute child repeat the words "ice cream" after the cafeteria announcement on board, as well as seagulls trying to keep pace with the ferry. Otherwise the heads were naturally pitch black. Refreshing still enough being on a free "cruise" of Sydney Harbour in darkness. Who cares, all of this for free. It would have been nice if the Manly Ferry was decorated with bright lights for the occasion, but then again I'm now nit-picking and I shouldn't. Exactly thirty minutes later, I'm at Manly. My food did not come for free, yet was still affordable. The corso is full of party people, and the pubs along this walkway are full with security guards present. 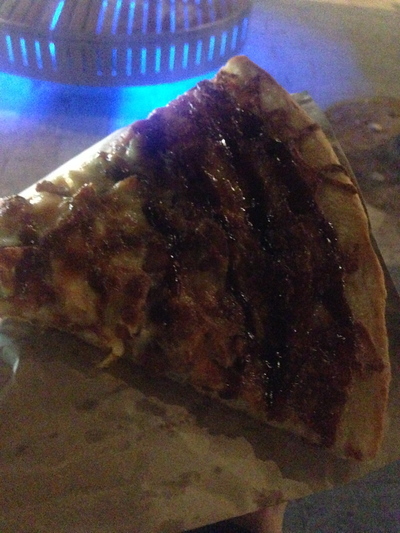 It was just awesome grabbing a piece of pizza ($4) just before heading to the beach. You would not go as far as Cabbage Bay when pitch black on a wintery Saturday night. 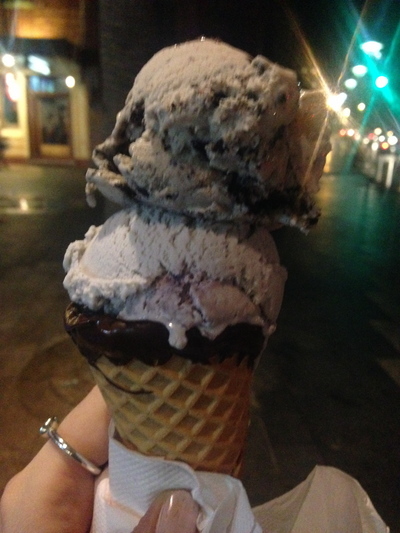 There were quite a few people at the beach, and despite being a rather windy Saturday night, I also enjoyed two scoops of a junior chocolate dipped cone ($5.90) that started to melt on a subtle tone. Great to keep my dinner under $10, and all easily filled the spot. Loved walking on the sand in full on winter clothes; even in black near knee high boots. Spend a great 10 minutes doing this with ideally an ice cream in tow, and you're in heaven. Stay warm and you'll be content. It does not take much to have a great Saturday night out. Whoever said that you need $500 cash in your wallet to then spend it all should be shot. 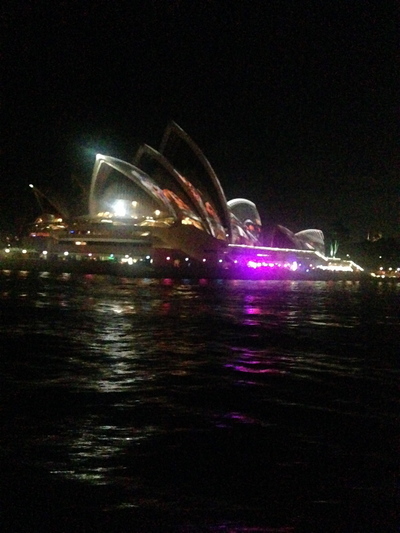 Still scored a good spot on the ferry back to Circular Quay, and the double take on Vivid Sydney was still amazing. Happy snaps abound. Despite not having a discount deal voucher, a Manly Ferry at Vivid Sydney time is priceless - even though you don't stick around the Vivid vantage points as long as you would on a dedicated Vivid Sydney cruise. A fun, simple activity to do on a Saturday night - either alone or in a small group. 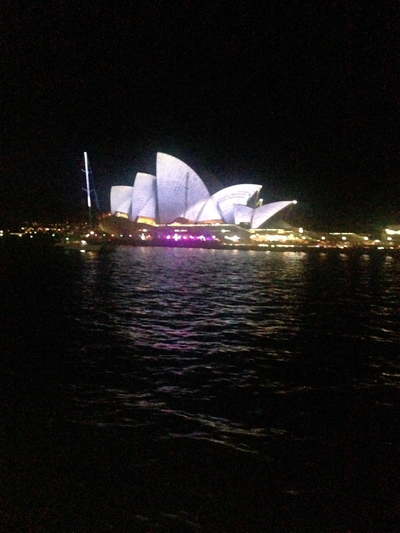 Great way to spend a Saturday night once in a while...go overseas, in Sydney Harbour that is! Where: Start at Circular Quay/The Rocks. The Manly Ferry departs at wharf # 3. And of course Manly. Why: A free (or cheap) cruise of Sydney Harbour at Vivid Sydney time, or Saturday night otherwise. Cost: Only had to pay for my food at Manly = $9.90. Otherwise all of this fun, simple entertainment for free. Good for kids: Yes. Except for the drinks at the bar of course. 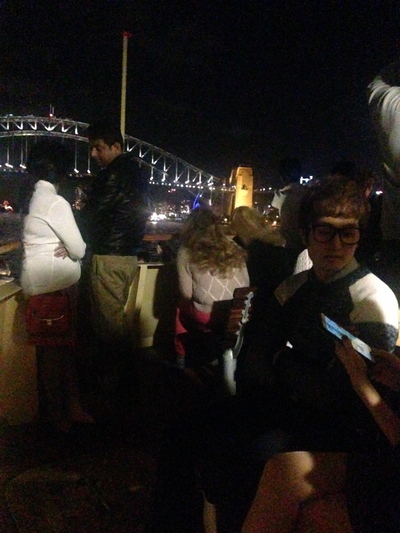 There were quite a fair few kids and prams etc on the Manly Ferry enjoying views of Vivid Sydney from the boat.